Your newly minted start-up needs to build a strong brand identity fast if you want to succeed in a competitive digital market, and the best way to do this is take the reins of a cohesive, impactful video marketing strategy. Research has shown that video marketing is the most effective way to drive conversions, as well as exhibiting the easiest path to a high marketing ROI, so the only question is, why haven’t you started using explainer videos to promote your company’s brand? CEO of www.explainervideo24.com, Oskar Majzner says: “Promotion videos are growing in popularity more and more because they offer an opportunity for you to connect your customers in a direct way to you company, products and services. Time is valuable to your customers and most often they don’t want to waste much of it reading through complex and lengthy text to understand a product or service”. Consumers are more than willing to share video marketing materials with others in their circle. This means expanding your brand’s exposure to new avenues based on a single video. To illustrate the reach of a video, Invodo estimates that Youtube searches for “how to” are increasing at a rate of about 70% year to year. In addition, explainer videos were the most popular videos for retailers in 2015. This shows that consumers are actively seeking out explainer videos for various products and services, and if your start-up isn’t filling that void, your brand is being limited in its reach. Additionally, 1 in 4 shoppers report using Youtube searches to find information on a product or service before they make a purchase, so it’s imperative that your product lines use video marketing to promote your brand and build loyalty. 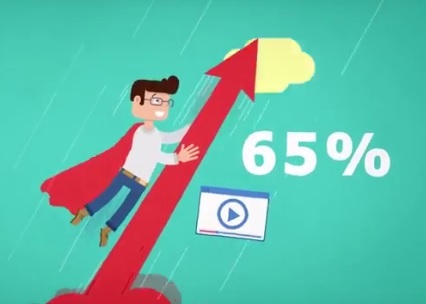 The power of explainer videos isn’t simply limited to the B2C sector, the B2B community also shows the impact of comprehending a company’s products and services, and videos that create a problem-solution link are extremely impactful in creating new leads and driving conversions in the business community. Among executives who viewed business related videos during work, an estimated 65% visited the marketer’s website to find out more about the product and the company. When an executive visits the site of a company to find out more about their products and brand, that brand is likely to stick with them, and if they’re satisfied with an eventual purchase, they won’t hesitate to recommend your brand to their peers and colleagues. The B2B community is full of busy decision-makers. If you ask an executive to read a drawn out explanation of the ways your company can provide solutions, they may never even start reading your marketing material. If you distill this information into a concise yet informative explainer video, executive decision makers will be more likely to view and pursue more information about your brand. Most email marketing is, frankly, rather disengaging, leading to a general trend of newsletter recipients to send marketing materials straight to their trash folders. Including some video content with your email blasts, however, increases the recipients’ likelihood of clicking through your marketing and sharing the video and other marketing materials, increasing the observed return on your email marketing investment. Do these statistics have you itching to get in on the trend of producing explainer videos to promote your brand? They should illustrate exactly how useful video marketing can be in building a strong brand that consumers will associate with solutions, both in the business and private communities. Web Design Tips: Give Stuff Away!